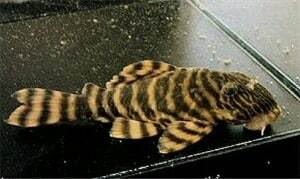 Typical Tank setup: A dimly lit tank with lots of cover (driftwood, rocks, plants) is necessary to house this beautifully patterned Pleco. 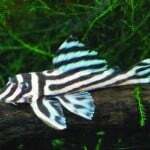 Compatibility: Ideal for community tanks, as this species is non-agressive and peaceful. 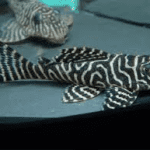 The Tiger Panaque is territorial in nature however, which means sufficient room and hiding places are required when kept with other bottomdwelling fish, especially with other Tiger Panaque’s or similar-looking Pleco’s. 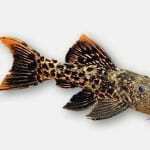 Feeding: This species is a wood-eating Pleco, which means drift wood is absolutely essential for its well-being. Although primarily vegetarian (fresh vegetables, algae pellets, sometimes aquarium plants), it will in many cases also accept meaty foods such as shrimp, blood worms and sinking carnivore tablets. 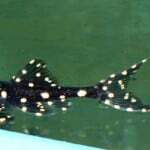 Sexing: Males develop (particularly on their pectoral fin rays and lower back) heavy teeth-like odontodal growth. Often this gives the male fish a hairy or ‘furry’ look. 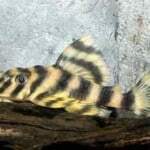 Breeding: Like other small Panaque species, the Tiger Panaque is not too hard to breed, but it is easily disturbed by other fish. 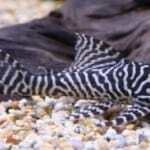 Therefore, breeding attempts will have a much larger chance of succes when kept in a species tank. 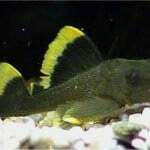 The division of sexes is ideal with one male for every 2-3 females: a tank measuring 80x40cm. (32×16″) is enough to house a (breeding) group of 5-6 individuals. 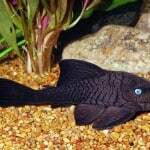 To breed this fish, the water temperature should be raised to 79-84 degrees F (26-29 degrees C). The Tiger Panaque is a cavebreeder: these can be built by stacking up pieces of slate or other decoration, or bought as prefab caves made of ceramic. Important is that the cave can only be accessed from one side – otherwise, they male will be unable to keep the female in the cave to lay here eggs. A powerful powerhead should be installed create water flow: the current should flow along the entrances of the caves. A diffusor unit can be attached, as the water should be very rich in oxygen. Once a pair has formed, the male will attempt to lure the female into his cave: there she will lay her eggs. The male takes care of the eggs, fanning his fins to provide a constant supply of oxygen. Unfertilized and infected eggs will be eaten by the male, but inexperienced males can also eat healthy eggs. Otherwise, the parents will not bother the eggs and fry. Once the fry hatches, they will remain in the cave until they have used up their yoke sack. Then they will emerge, and can be taken out to be raised in a separate tank.